Rare Ancient "Ptolemaic Cartonnage Mummy Mask"
The above listed item is from the Ptolemaic Period,(332-30 B.C.E.). This incredible "Wooden Mummy Mask" was carved from a single piece of palm, acacia, sycamore or cedar wood then, detailed in black, burnt orange, brick red and olive green paints. The cartonnage/gesso,(a paste, papier-mache like substance) is part of the overall covering . It has areas of earthen encrustation, usually found on ancient Egytpian, wood carved, tomb relics. We acquired this lovely piece from a select private collection and its provenance is from Alexandria, Egypt. 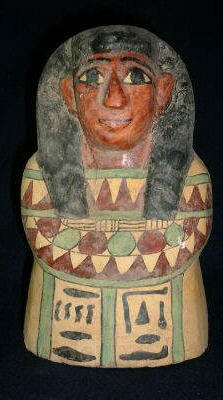 It has a black Nemes headdress, the facial features are very prominent and highly detailed with paint. 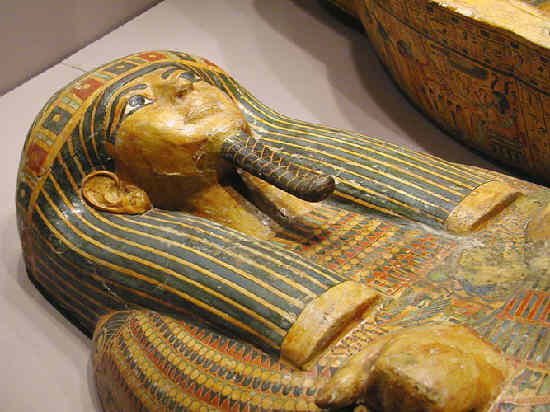 There are two partial rows of hieroglyphics where the mask was cut off at the main coffin. 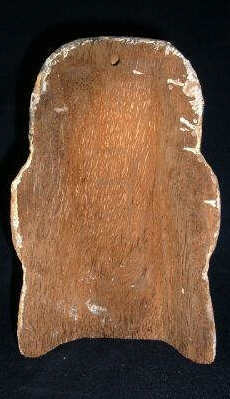 On reverse, there is a hole where the mask was attached to the outside of the coffin. This piece is intact and is an excellent example of Ptolemaic Period mummy masks! The reason for the item being available is due to the vast extent of archeological findings, thousands of years in Egyptian burials and also the proliferation of these said items in older private collections worldwide. 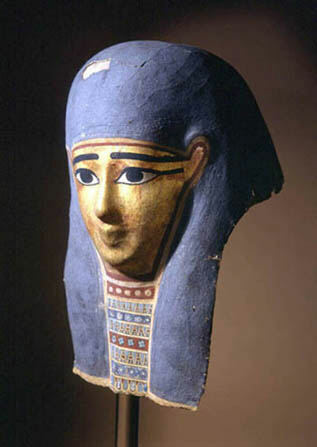 Mummy mask; cartonnage (linen and gesso), paint, gilding. Ptolemaic. Hearts Museum. Berkeley, USA. A late period cartonnage anthropoid coffin. Egyptian Museum, Cairo, Egypt.